Professor Lisa Rofel will retire at the end of June after 27 years at UC Santa Cruz. Prof. Rofel is among the world’s leading scholars of Chinese modernity and the nature of contemporary capitalism. She pioneered innovative approaches to the particularity of capitalist experiences, most notably with respect to differences based on gender, labor, and social inequality. Prof. Rofel’s scholarship, teaching, and research have promoted awareness and activism on behalf of under-represented groups, including sexual minorities, women, and socioeconomically disadvantaged groups, while broadening understanding of our interconnected world. She is known as a generous and dynamic teacher who integrates unfolding contemporary events into classes to spark student interest and critical thinking. 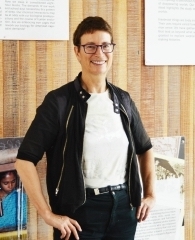 As chair of the Anthropology Department during one of the worst budget crises ever faced by the University of California, Prof. Rofel maintained faculty and staff morale while preserving the department’s reputation for excellence. Recognzing the need to chronicle our achievements, she commissioned this annual newsletter. Prof. Rofel is the founding director of the Center for Emerging Worlds, an intellectual hub which provides a forum for discussing critical geo-political issues around the world. Prof. Rofel’s numerous invited lectures around the world, service on several editorial boards, and her leadership as the Chair of the China and Inner Asia Council are evidence of her international recognition.